I got some great video from the whole thing, so while I’m putting together the video, check out my (and guest shooter Nasser’s) photos below. It was a very exciting evening starting out with Unibouzo and Slo Feng duking it out. Dai Hachi Hachi and Yarsminko then battled it out with Dai Hachi Hachi seeming to hump everything in site. (I love when the Plantains did this years ago) then the Steam Powered Tentacle Boulder came out and joined the fray. Grudyin and Dusto Bunny went to town destroying the city. Cylcoptopus and French Toast go at it, and low and behold, Dr. Cube is “back from the dead” and wreaking havoc. 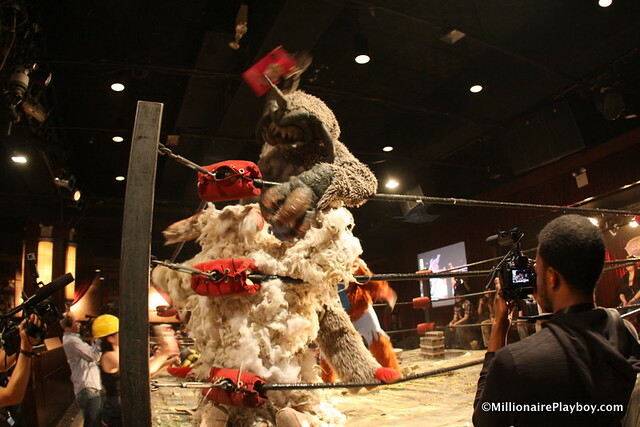 We also got to see Hell Monkey, American Beetle and my personal favorite, Kung Fu Chicken Noodle in a royal slam down. Check out our own Kaiju video now!